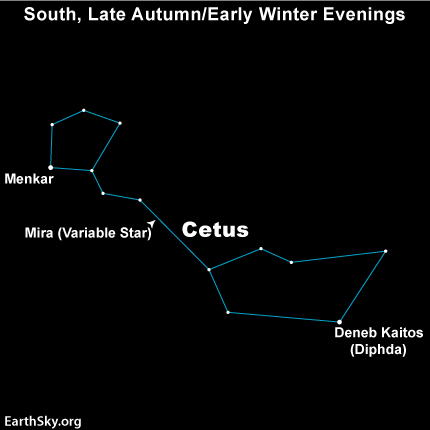 Look for Deneb Kaitos – brightest star in Cetus the Whale – highest in the sky around mid-evening. 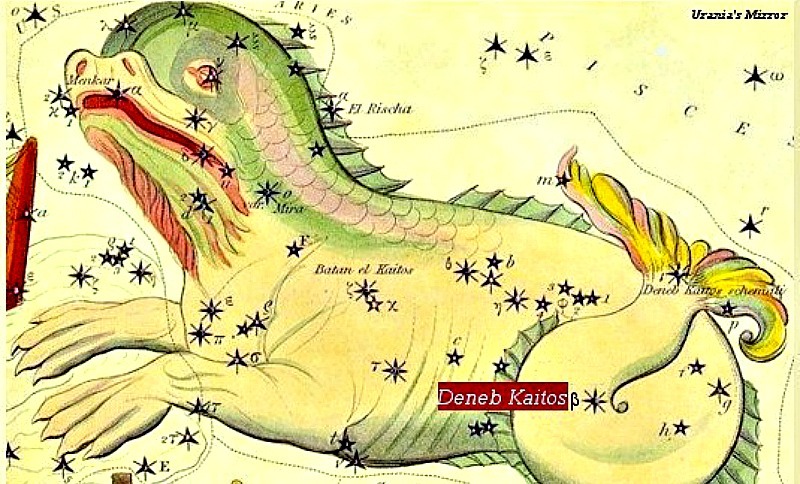 Deneb Kaitos (Beta Ceti, sometimes also called Beta Ceti and Diphda) ranks as the brightest star in the constellation Cetus the Whale (or Sea-Monster). This star shines about as brightly as Polaris the North Star. There’s a famous variable star also in Cetus, called Mira the Wonderful. And Mira might sometimes brightens enough to match Deneb Kaitos, though only extremely rarely. Mira typically remains much too faint to see with the unaided eye; its next maximum brightness is forecast for late December 2017. Meanwhile, Deneb Kaitos soars highest in the sky around October and November every year. For us in the Northern Hemisphere it appears in the southern sky; it’s more overhead as seen from Earth’s Southern Hemisphere. You’ll find Deneb Kaitos shining highest at about 9-10 p.m. local time – that’s the time on your clock, no matter where you are on the globe – from now until about mid-November. 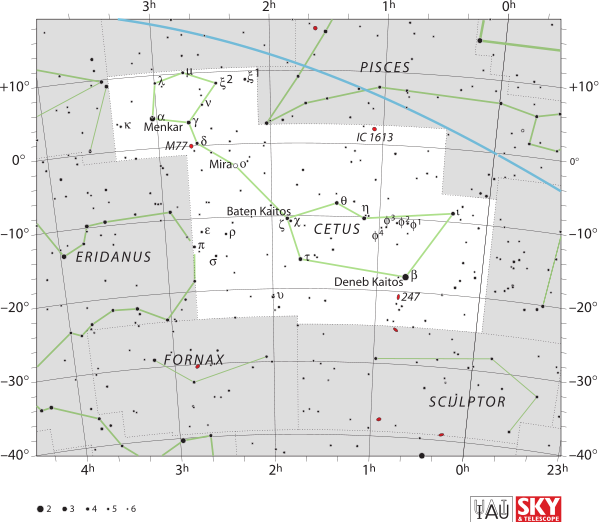 IAU chart of Cetus the Whale, via IAU and Sky & Telescope magazine (Roger Sinnott & Rick Fienberg). The stars return to the same place in the sky about 2 hours earlier with each passing month (or four minutes earlier with each passing day). In middle January, look for Deneb Kaitos to reach its high point around 7 p.m. local time. On February evenings, this star drifts into the southwest sky, and disappears from the evening sky by March. 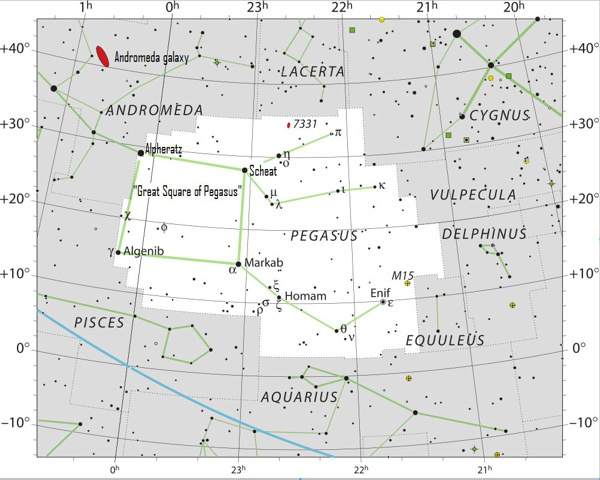 It’s easy to locate Deneb Kaitos if you’re familiar with the Great Square of Pegasus. Locate the star by drawing an imaginary line through the two Great Square stars Alpheratz and Algenib. Deneb Kaitos is an orange giant and easy to identify due to its location in a section of the sky filled with fainter stars. Based on parallax measurements, it lies at an estimated distance of 96 light-years from Earth. Deneb Kaitos has a diameter some 17 times larger than our sun’s. Check out this star with binoculars sometime and note its orange complexion. The orange color indicates a rather low surface temperature, and also lets us know that this star is entering into the autumn of its years. Bottom line: Deneb Kaitos, or Beta Ceti, is the brightest star in the constellation Cetus the Whale.